, an Italian poet, was born at Florence in 1646, of poor and humble parents. Notwithstanding the disadvantage of his circumstances, he began his studies under Miglioraccio, and pursued them with ardour; till, being noticed for his talents by Vincentio SaU viati, he, was removed from the difficulties of poverty, received into the house of that patron, and encouraged to indulge his genius in writing. In 1674, he inscribed a volume of poems to Cosmo III. of Medicis, but obtained Do great approbation from that depraved man. In 1679, he published a book, entitled “Construzione irregolare della linga Toscana;” on the irregular construction of the Tuscan language; and, in the following year, a volume of lyric poems, by way of illustrating his own precepts. His first patron seems now to have deserted him, or not to have afforded him sufficient support, for we find hirn at this period, after several disappointments, and particularly that of not obtaining a professorship at Pisa, venting his discontent in twelve satires. These, however, were not published in his life, but given to a friend, Paulo Falconeri. When they did appear, they went through several editions. In 1685, Menzini obtained the notice and patronage of Christina queen of Sweden, whom he celebrated in Latin as well as in Italian. Under her protection he lived at Rome, and enjoyed the best period of his life. 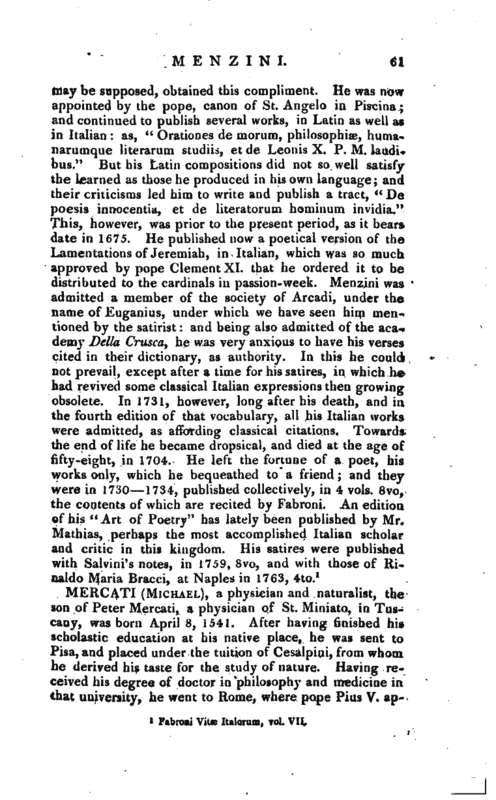 It was at this period, in 1688, that he published his “Arte Poetiea,” which he dedicated to cardinal Azzolini. 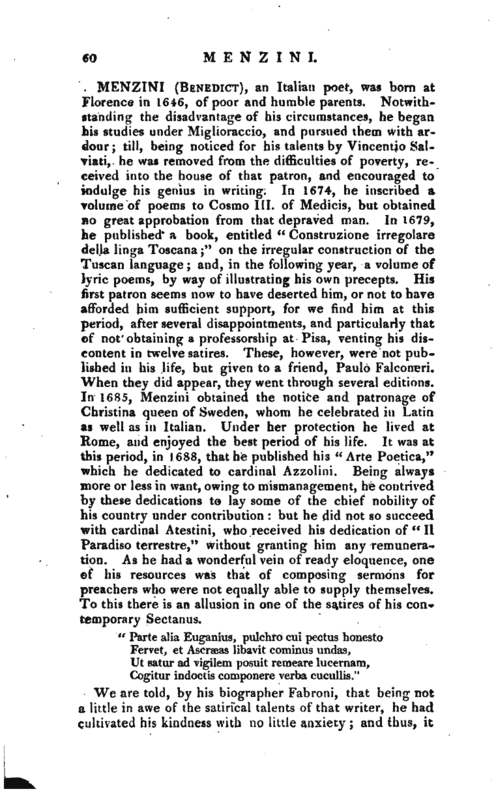 Being always more or less in want, owing to mismanagement, he contrived by these dedications to lay some of the chief nobility of his country under contribution: but he did not so succeed with cardinal Atestini, who received his dedication of “II Paradiso terrestre,” without granting him any remuneration. As he had a wonderful vein of ready eloquence, one of his resources was that of composing sermons for preachers who were not equally able to supply themselves. To this there is an allusion in one of the satires of his con<­temporary Sectanus. Cogitur indoctis componere verba cucullis." Fabroni Vitae Italorum, vol. VII.